A Site-to-Site VPN gateway connection is used to connect your on-premises network to an Azure virtual network over an IPsec/IKE (IKEv1 or IKEv2) VPN tunnel. This type of connection requires a VPN device located on-premises that has an externally facing public IP address assigned to it. For more information about VPN gateways, see About VPN gateway. Make sure you have a compatible VPN device and someone who is able to configure it. For more information about compatible VPN devices and device configuration, see About VPN Devices. Verify that you have an externally facing public IPv4 address for your VPN device. If you are unfamiliar with the IP address ranges located in your on-premises network configuration, you need to coordinate with someone who can provide those details for you. When you create this configuration, you must specify the IP address range prefixes that Azure will route to your on-premises location. None of the subnets of your on-premises network can over lap with the virtual network subnets that you want to connect to. The examples in this article use the following values. You can use these values to create a test environment, or refer to them to better understand the examples in this article. For more information about VPN Gateway settings in general, see About VPN Gateway Settings. DNS Server: 8.8.8.8 - Optional. The IP address of your DNS server. Shared key: For this example, we use abc123. But, you can use whatever is compatible with your VPN hardware. The important thing is that the values match on both sides of the connection. To create a VNet in the Resource Manager deployment model by using the Azure portal, follow the steps below. Use the example values if you are using these steps as a tutorial. If you are not doing these steps as a tutorial, be sure to replace the values with your own. For more information about working with virtual networks, see the Virtual Network Overview. In order for this VNet to connect to an on-premises location you need to coordinate with your on-premises network administrator to carve out an IP address range that you can use specifically for this virtual network. If a duplicate address range exists on both sides of the VPN connection, traffic does not route the way you may expect it to. Additionally, if you want to connect this VNet to another VNet, the address space cannot overlap with other VNet. Take care to plan your network configuration accordingly. Click Create a resource. In the Search the marketplace field, type 'virtual network'. Locate Virtual network from the returned list and click to open the Virtual Network page. Near the bottom of the Virtual Network page, from the Select a deployment model list, select Resource Manager, and then click Create. This opens the 'Create virtual network' page. On the Create virtual network page, configure the VNet settings. When you fill in the fields, the red exclamation mark becomes a green check mark when the characters entered in the field are valid. Name: Enter the name for your virtual network. In this example, we use VNet1. Address space: Enter the address space. If you have multiple address spaces to add, add your first address space. You can add additional address spaces later, after creating the VNet. Make sure that the address space that you specify does not overlap with the address space for your on-premises location. Subscription: Verify that the subscription listed is the correct one. You can change subscriptions by using the drop-down. Resource group: Select an existing resource group, or create a new one by typing a name for your new resource group. If you are creating a new group, name the resource group according to your planned configuration values. For more information about resource groups, visit Azure Resource Manager Overview. Location: Select the location for your VNet. The location determines where the resources that you deploy to this VNet will reside. Subnet: Add the first subnet name and subnet address range. You can add additional subnets and the gateway subnet later, after creating this VNet. Select Pin to dashboard if you want to be able to find your VNet easily on the dashboard, and then click Create. After clicking Create, you will see a tile on your dashboard that will reflect the progress of your VNet. The tile changes as the VNet is being created. DNS is not required to create a Site-to-Site connection. However, if you want to have name resolution for resources that are deployed to your virtual network, you should specify a DNS server. This setting lets you specify the DNS server that you want to use for name resolution for this virtual network. It does not create a DNS server. For more information about name resolution, see Name Resolution for VMs and role instances. On the Settings page for your virtual network, navigate to DNS Servers and click to open the DNS servers page. Add DNS server: Enter the IP address of the DNS server that you want to use for name resolution. When you are done adding DNS servers, click Save at the top of the page. The virtual network gateway uses specific subnet called the gateway subnet. The gateway subnet is part of the virtual network IP address range that you specify when configuring your virtual network. It contains the IP addresses that the virtual network gateway resources and services use. The subnet must be named 'GatewaySubnet' in order for Azure to deploy the gateway resources. You can't specify a different subnet to deploy the gateway resources to. If you don't have a subnet named 'GatewaySubnet', when you create your VPN gateway, it will fail. When you create the gateway subnet, you specify the number of IP addresses that the subnet contains. The number of IP addresses needed depends on the VPN gateway configuration that you want to create. Some configurations require more IP addresses than others. We recommend that you create a gateway subnet that uses a /27 or /28. If you see an error that specifies that the address space overlaps with a subnet, or that the subnet is not contained within the address space for your virtual network, check your VNet address range. You may not have enough IP addresses available in the address range you created for your virtual network. For example, if your default subnet encompasses the entire address range, there are no IP addresses left to create additional subnets. You can either adjust your subnets within the existing address space to free up IP addresses, or specify an additional address range and create the gateway subnet there. In the portal, navigate to the virtual network for which you want to create a virtual network gateway. In the Settings section of your VNet page, click Subnets to expand the Subnets page. The Name for your subnet is automatically filled in with the value 'GatewaySubnet'. The GatewaySubnet value is required in order for Azure to recognize the subnet as the gateway subnet. Adjust the auto-filled Address range values to match your configuration requirements. To create the subnet, click OK at the bottom of the page. When working with gateway subnets, avoid associating a network security group (NSG) to the gateway subnet. Associating a network security group to this subnet may cause your VPN gateway to stop functioning as expected. For more information about network security groups, see What is a network security group? On the Create virtual network gateway page, specify the values for your virtual network gateway. Name: Name your gateway. This is not the same as naming a gateway subnet. It's the name of the gateway object you are creating. Gateway type: Select VPN. VPN gateways use the virtual network gateway type VPN. VPN type: Select the VPN type that is specified for your configuration. Most configurations require a Route-based VPN type. SKU: Select the gateway SKU from the dropdown. The SKUs listed in the dropdown depend on the VPN type you select. For more information about gateway SKUs, see Gateway SKUs. Only select Enable active-active mode if you are creating an active-active gateway configuration. Otherwise, leave this setting unselected. Location: You may need to scroll to see Location. Adjust the Location field to point to the location where your virtual network is located. For example, West US. If the location is not pointing to the region where your virtual network resides, when you select a virtual network in the next step, it will not appear in the drop-down list. Virtual network: Choose the virtual network to which you want to add this gateway. Click Virtual network to open the 'Choose a virtual network' page. Select the VNet. If you don't see your VNet, make sure the Location field is pointing to the region in which your virtual network is located. Gateway subnet address range: You will only see this setting if you did not previously create a gateway subnet for your virtual network. If you previously created a valid gateway subnet, this setting will not appear. Public IP address: This setting specifies the public IP address object that gets associated to the VPN gateway. The public IP address is dynamically assigned to this object when the VPN gateway is created. VPN Gateway currently only supports Dynamic Public IP address allocation. However, this does not mean that the IP address changes after it has been assigned to your VPN gateway. The only time the Public IP address changes is when the gateway is deleted and re-created. It doesn't change across resizing, resetting, or other internal maintenance/upgrades of your VPN gateway. In the text box, type a Name for your public IP address. Leave Configure BGP ASN deselected, unless your configuration specifically requires this setting. If you do require this setting, the default ASN is 65515, although this can be changed. Verify the settings. You can select Pin to dashboard at the bottom of the page if you want your gateway to appear on the dashboard. Click Create to begin creating the VPN gateway. 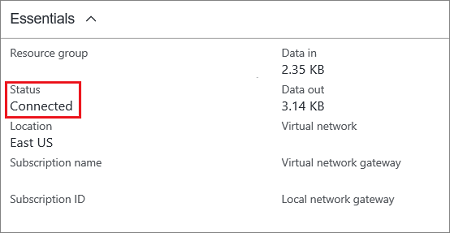 The settings are validated and you'll see the "Deploying Virtual network gateway" tile on the dashboard. Creating a gateway can take up to 45 minutes. You may need to refresh your portal page to see the completed status. gateway. After the gateway is created, view the IP address that has been assigned to it by looking at the virtual network in the portal. The gateway appears as a connected device. You can click the connected device (your virtual network gateway) to view more information. The local network gateway typically refers to your on-premises location. 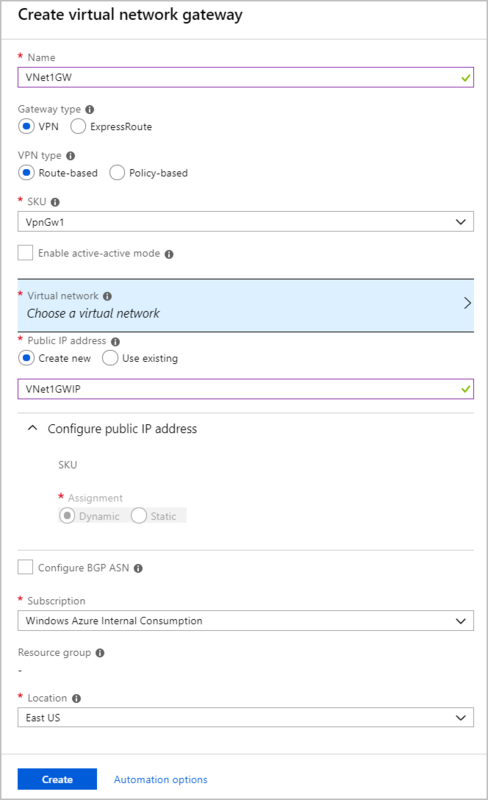 You give the site a name by which Azure can refer to it, then specify the IP address of the on-premises VPN device to which you will create a connection. You also specify the IP address prefixes that will be routed through the VPN gateway to the VPN device. The address prefixes you specify are the prefixes located on your on-premises network. If your on-premises network changes or you need to change the public IP address for the VPN device, you can easily update the values later. In the portal, click +Create a resource. In the search box, type Local network gateway, then press Enter to search. This will return a list of results. Click Local network gateway, then click the Create button to open the Create local network gateway page. On the Create local network gateway page, specify the values for your local network gateway. Name: Specify a name for your local network gateway object. IP address: This is the public IP address of the VPN device that you want Azure to connect to. Specify a valid public IP address. If you don't have the IP address right now, you can use the values shown in the example, but you'll need to go back and replace your placeholder IP address with the public IP address of your VPN device. Otherwise, Azure will not be able to connect. Address Space refers to the address ranges for the network that this local network represents. You can add multiple address space ranges. Make sure that the ranges you specify here do not overlap with ranges of other networks that you want to connect to. 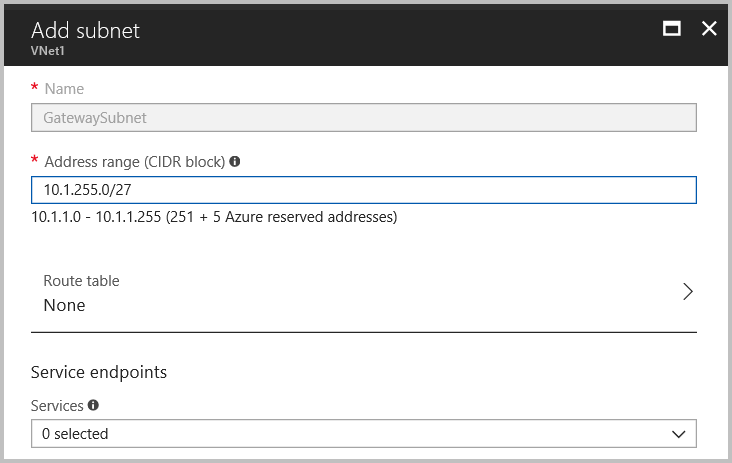 Azure will route the address range that you specify to the on-premises VPN device IP address. Use your own values here if you want to connect to your on-premises site, not the values shown in the example. Configure BGP settings: Use only when configuring BGP. Otherwise, don't select this. Subscription: Verify that the correct subscription is showing. Resource Group: Select the resource group that you want to use. You can either create a new resource group, or select one that you have already created. Location: Select the location that this object will be created in. You may want to select the same location that your VNet resides in, but you are not required to do so. When you have finished specifying the values, click the Create button at the bottom of the page to create the local network gateway. A shared key. This is the same shared key that you specify when creating your Site-to-Site VPN connection. In our examples, we use a basic shared key. We recommend that you generate a more complex key to use. The Public IP address of your virtual network gateway. You can view the public IP address by using the Azure portal, PowerShell, or CLI. To find the Public IP address of your VPN gateway using the Azure portal, navigate to Virtual network gateways, then click the name of your gateway. Depending on the VPN device that you have, you may be able to download a VPN device configuration script. For more information, see Download VPN device configuration scripts. For information about compatible VPN devices, see VPN Devices. Before configuring your VPN device, check for any Known device compatibility issues for the VPN device that you want to use. For links to device configuration settings, see Validated VPN Devices. The device configuration links are provided on a best-effort basis. It's always best to check with your device manufacturer for the latest configuration information. The list shows the versions we have tested. If your OS is not on that list, it is still possible that the version is compatible. Check with your device manufacturer to verify that OS version for your VPN device is compatible. For an overview of VPN device configuration, see Overview of 3rd party VPN device configurations. For information about editing device configuration samples, see Editing samples. For cryptographic requirements, see About cryptographic requirements and Azure VPN gateways. For information about IPsec/IKE parameters, see About VPN devices and IPsec/IKE parameters for Site-to-Site VPN gateway connections. This link shows information about IKE version, Diffie-Hellman Group, Authentication method, encryption and hashing algorithms, SA lifetime, PFS, and DPD, in addition to other parameter information that you need to complete your configuration. For IPsec/IKE policy configuration steps, see Configure IPsec/IKE policy for S2S VPN or VNet-to-VNet connections. To connect multiple policy-based VPN devices, see Connect Azure VPN gateways to multiple on-premises policy-based VPN devices using PowerShell. Create the Site-to-Site VPN connection between your virtual network gateway and your on-premises VPN device. Navigate to and open the page for your virtual network gateway. There are multiple ways to navigate. You can navigate to the gateway 'VNet1GW' by going to TestVNet1 -> Overview -> Connected devices -> VNet1GW. On the page for VNet1GW, click Connections. At the top of the Connections page, click +Add to open the Add connection page. On the Add connection page, configure the values for your connection. Virtual network gateway: The value is fixed because you are connecting from this gateway. Local network gateway: Click Choose a local network gateway and select the local network gateway that you want to use. Shared Key: the value here must match the value that you are using for your local on-premises VPN device. The example uses 'abc123', but you can (and should) use something more complex. The important thing is that the value you specify here must be the same value that you specify when configuring your VPN device. The remaining values for Subscription, Resource Group, and Location are fixed. Click OK to create your connection. You'll see Creating Connection flash on the screen. You can view the connection in the Connections page of the virtual network gateway. The Status will go from Unknown to Connecting, and then to Succeeded. In the Azure portal, you can view the connection status of a Resource Manager VPN Gateway by navigating to the connection. The following steps show one way to navigate to your connection and verify. In the Azure portal, click All resources and navigate to your virtual network gateway. On the blade for your virtual network gateway, click Connections. You can see the status of each connection. Click the name of the connection that you want to verify to open Essentials. In Essentials, you can view more information about your connection. The Status is 'Succeeded' and 'Connected' when you have made a successful connection. Locate the private IP address. You can find the private IP address of a VM in multiple ways. Below, we show the steps for the Azure portal and for PowerShell. Verify that you are connected to your VNet using the VPN connection. Resetting an Azure VPN gateway is helpful if you lose cross-premises VPN connectivity on one or more Site-to-Site VPN tunnels. In this situation, your on-premises VPN devices are all working correctly, but are not able to establish IPsec tunnels with the Azure VPN gateways. For steps, see Reset a VPN gateway. For the steps to change a gateway SKU, see Gateway SKUs. You can add additional connections, provided that none of the address spaces overlap between connections. To add an additional connection, navigate to the VPN gateway, then click Connections to open the Connections page. Click +Add to add your connection. Adjust the connection type to reflect either VNet-to-VNet (if connecting to another VNet gateway), or Site-to-site. If you are connecting using Site-to-site and you have not already created a local network gateway for the site you want to connect to, you can create a new one. Specify the shared key that you want to use, then click OK to create the connection. For information about BGP, see the BGP Overview and How to configure BGP. For information about forced tunneling, see About forced tunneling. For information about Highly Available Active-Active connections, see Highly Available cross-premises and VNet-to-VNet connectivity. For information about how to limit network traffic to resources in a virtual network, see Network Security. For information about how Azure routes traffic between Azure, on-premises, and Internet resources, see Virtual network traffic routing. For information about creating a Site-to-Site VPN connection using Azure Resource Manager template, see Create a Site-to-Site VPN Connection. For information about creating a Vnet-to-Vnet VPN connection using Azure Resource Manager template, see Deploy HBase geo replication.